Everyone is confronted by hazards every day — in their commute to work, the food they consume, the tools they employ and, in some places, the very air they breathe. Hazards form the foundation of risk management. In order to reduce risk to a level as low as reasonably practicable, potential hazards must be identified and then reported, discussed, analyzed and, ultimately, mitigated. 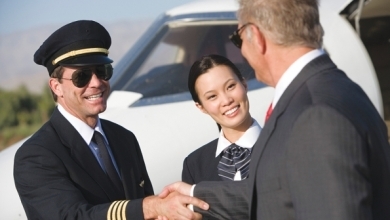 These fundamentals can be applied to almost all human activity, and that most assuredly includes managing the business within a business aircraft cabin. Penny Stockdale, manager of cabin services for Jet Aviation, says her company’s Safety Management System (SMS) is so inclusive that questions about risk aversion and safety are part of the interview process for potential flight attendants. Pat Cunningham, director of aviation at PepsiCo Inc., began his business aviation career as a maintenance technician. Early on, he was a flight technician on board company aircraft to provide maintenance support as well as cabin service. Another hazard discovered and rectified involved the flight technicians, a role once served by Cunningham. “Our flight techs would fly a trip and due to a discrepancy arising, work hours past the arrival in order to have the aircraft ready to fly the next day,” he recalls. “It was noted that fatigue was becoming an issue with our flight technicians and we limited the requirement, especially upon return to home base, for their contribution to post-flight maintenance.” Today, PepsiCo’s flight technicians fall under the same fatigue management guidelines as applies to its pilots. People are the No. 1 source of hazard identification during the normal conduct of work. Two examples of systemic, procedural hazards that could negatively impact passengers in flight: The hangar ice machine does not have a schedule for periodic cleaning and the ice scoop is typically stowed on top of the ice when not in use; and catering ordered at an intermediate stopover is delivered to the aircraft by the FBO’s lavatory service cart driver. While NTSB reports abound with cockpit crew errors, there’s plenty that can go wrong in that comfortable, well-appointed and welcoming cabin in back. And that’s why there’s a crewmember assigned to oversee activity there. The primary role of a flight attendant is to provide aid to any passenger in distress, and, if necessary, manage the passengers’ evacuation from the aircraft in an emergency. Beyond that, hazards abound within the confines of a business aircraft cabin. Potential issues might lead to a spill, slip, trip, burn, bump, tear, mark in a side panel or overhead, pinched finger incurred when trying to incorrectly deploy a tray table or recline a chair, or incorrect use of emergency equipment when needed. Such checklist items not only recognize potential hazards but are often the byproduct of hard experience. Experience is certainly helpful when managing different equipment and procedures within the cabins of various large business jets, and that can be a particular challenge for contract flight attendants working an aircraft for the first time. I well remember an incident aboard a colleague’s Gulfstream IV when a veteran contract flight attendant placed several tinfoil containers into the galley’s high-temp oven just before takeoff. The container lids had paper on top upon which the caterer could note the contents within. Unfortunately, the oven’s high temperature caused the exposed paper to burn and the Gulfstream pilots had to execute an emergency return shortly after takeoff due to smoke in the cabin. Elaine Lapotosky, director of operations at Jet Professionals and chair of the NBAA Flight Attendant Committee, notes that her company has partnered with FlightSafety to provide flight attendant training at a discounted rate and that independent cabin crewmembers working through Jet Professionals can cover that expense via deductions from their wages. Once a hazard has been identified and reported, the process within the flight department’s SMS comes into play. This process should allow everyone within the organization to participate. However, a contract flight attendant may be reluctant to report a hazard for fear of being deemed a critic of the flight operation and its permanent employees and not being hired again. However, since cabin hazards, especially those encountered in flight with passengers aboard, are typically beyond the purview of the pilots up front, the reluctance to report seems unjustified. 7.4.1: Caterers should be properly licensed, insured and demonstrate compliance with appropriate food regulations. 7.4.2: FBOs must maintain and manage procedures utilized in the sourcing and handling of potable water and ice. 7.4.3: Refrigeration of catering/food available for placement on an aircraft must be stored separately from food items that have been offloaded from other aircraft. 7.4.4: The FBO must have a formal procedure for proper cleaning, storage and handling of dishes, silverware and food containers. Pat Bennett, a highly experienced flight attendant based in Seattle, says that during a typical year she might serve aboard five or six different types of business jets with various sized cabins and whose emergency equipment, ovens, entertainment systems and storage areas are dissimilar. Again, the primary role of a flight attendant is to provide passengers with a safe and secure environment. To do that requires vigilance, competence, systems knowledge and proven ability. In a word: professionalism. And if all that can be accompanied with a warm welcome and a smile, it’s likely to be a good trip.